Burgmans Benedict is a German bred Hannovarian by Borneo (by Bolero) out of Welfee. 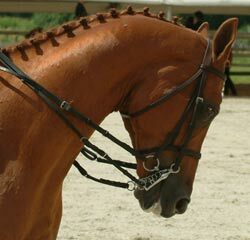 He is a chestnut gelding and is born in 1994. Philippa’s partnership with Benedict is a very special one. he would be the happiest horse in the world. He is also a horse that has many different expressions. He lets you know in no uncertain cheap jerseys terms what he is thinking or feeling. He is a very brave horse. You can fly an F16 fighter jet between his ears and he doesn’t do a thing. landing and doing bumps and circuits every day over the stables. He dislikes farm animals, so don’t ask him to pas a cow, sheep or an alpaca. He thinks they are really scary. Breed:Verband Hannoverscher cheap jerseys Pferdezüchter e.V.